The need for fibres in our diet is not a topic that many like to discuss; however, I’m willing to touch on this topic because it’s a topic that is important to me. You see, as I’ve gotten older, I’ve noticed that I’ve had more difficulty in being regular. Metamucil Fibre has been trusted for over 75 years; and offers great ways to get the fibre your body needs. Personally, I don’t usually drink a lot of water (I know, that isn’t a good thing) so using Metamucil in powder form (you stir up in water and drink) is not the form of fibre for me. I tried Metamucil 17+ years ago; before I was pregnant, and had a really tough time with it … tough enough that I would never try it again. Until now. 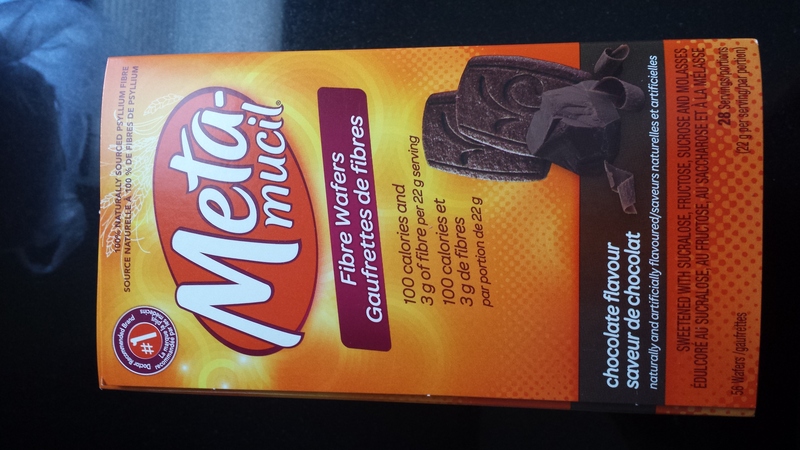 Recently, I received a box of Metamucil Chocolate Flavour Fibre Wafers and have finally found the fibre for me! Wow! 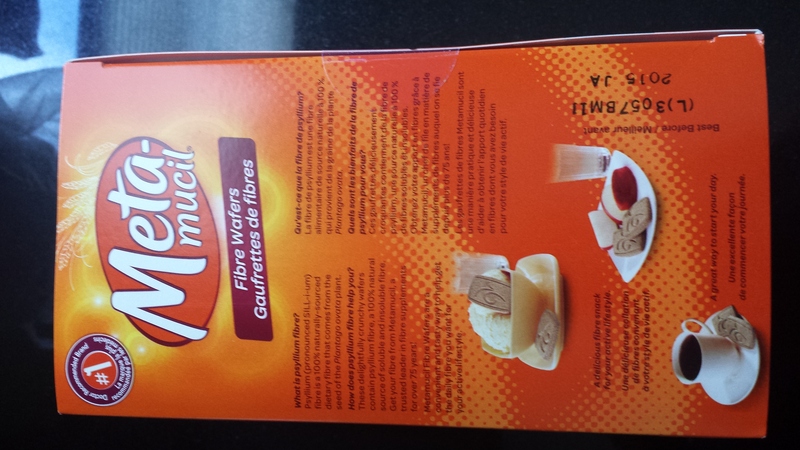 I LOVE these wafers and would recommend them to all of my family and friends. Each 22 g serving/portion has 100 calories and 3 g of fibre. Apparently Metamucil Fibre Wafers are also available in Cinnamon Spice and Apple Crisp; however, I haven’t seen these at the store yet. We all know how much I love chocolate so I’m quite happy sticking to this flavour of fibre wafers. Good to note: it isn’t too sweet either; you can enjoy the fibre wafers on their own with your choice of a cold or hot beverage, and you can enjoy the wafers as a snack with fruit or even ice cream! You can eat up to 3 servings per day. 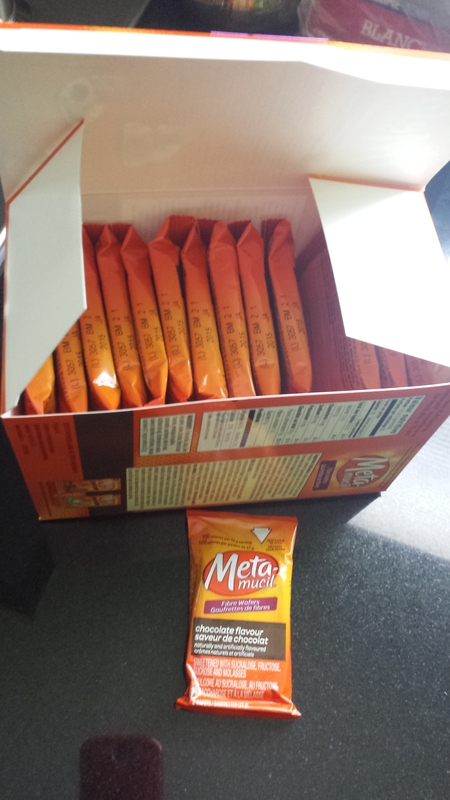 Metamucil contains psyllium. Psyllium is a source of both soluble and insoluble fibre. Soluble fibre helps to soften stools. It will either form a gel-like material when added to water (such as psyllium fibre found Metamucil) or it will dissolve completely in water. Insoluble fibre does not dissolve in water. It moves through your digestive system largely intact so it helps to bulk up stools. Both kinds are important. These chocolate flavour fibre wafers are crispy, crunchy and extremely flavourful. 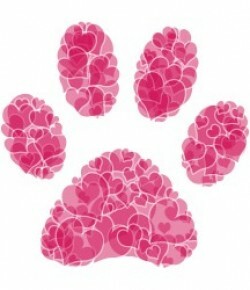 They are very enjoyable (very much like a mild, yummy chocolate biscuit) and very effective. No need to fill up on several glasses of water; you still need to drink water just not several glasses of water all at once. I like to have my fibre wafers with my morning cup of coffee. On certain days, I like to have a second serving in the afternoon as my snack. The end result is one happy lady. Being diabetic I need lots of fiber in my diet. I regularly eat All-Bran Cranberry Clusters and foods rich in fiber like chick peas, lentils, and such. 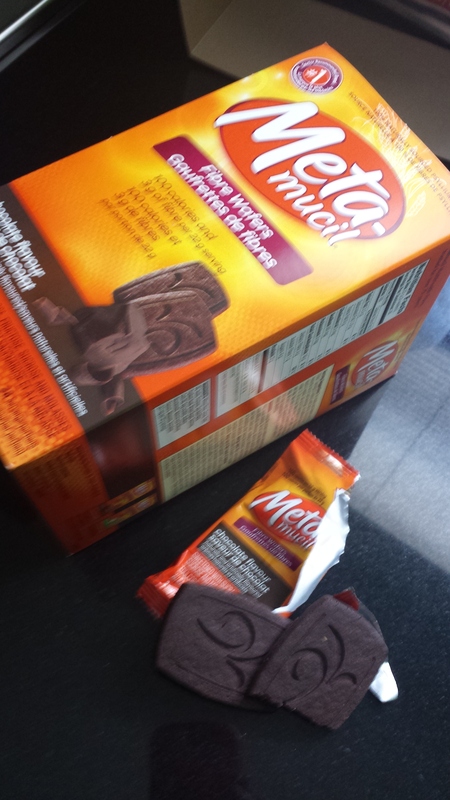 Have to give these a try, I know I’m not a fan of the drinkable Metamucil, but willing to give these a shot.